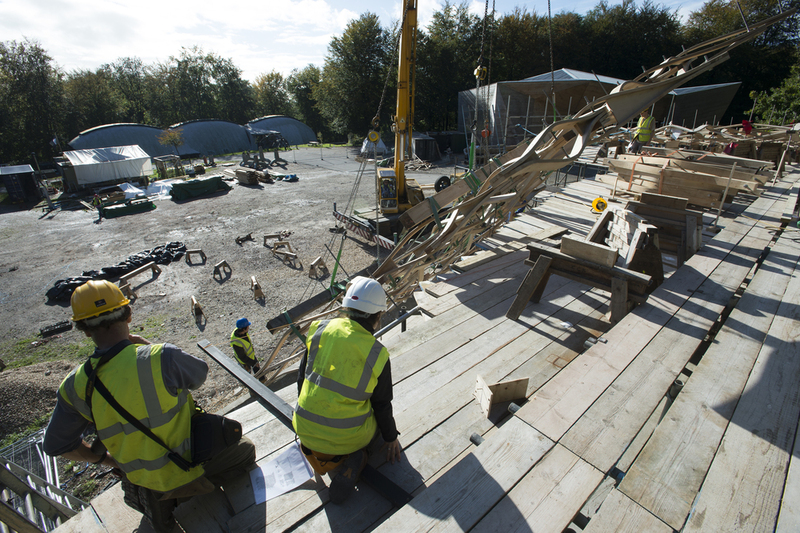 The mono-material construction technique of the 200m2 canopy requires 3 cubic meters of clear, vertical grain Beech which was hand selected from the site alongside foresters Jez Ralph, Chris Sadd and Nick Pulford. Material acquisition was one of my principle roles in the fabrication process. These pneumatic rams were donated on a chance visit to a nearby power station being deconstructed. Finding these rams in a recycling pile was one of those sought after lightbulb moments and the technique proved successful, eliminating the use of clamps from the bending process. A 1:1 mockup was constructed to test the reciprocal design and detail functionality. 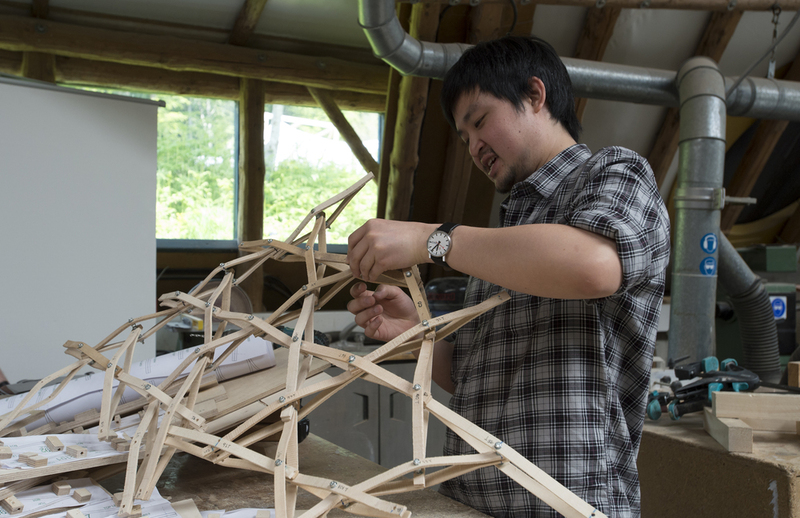 A 1:10 scaled model was constructed to text the overall geometry and building form in addition to the fabrication sequencing. Varies fabrication techniques were tested in this scaled mock up including the use of a 1:1 projection which was then implemented in the full scale construction. The construction of the main jig. All Beech components were bent simultaneously in this variable jig which is manually adjusted to a 1:1 digital projection of each component eliminating the need for paper drawings. The jig in full use with 20, two tonne pneumatic rams. After the components are steamed and bent they are left to season overnight (shown on the right clamped) and then assembled permanently as a pair with two split rings, and then finally installed into the patch in it's unique position and orientation. 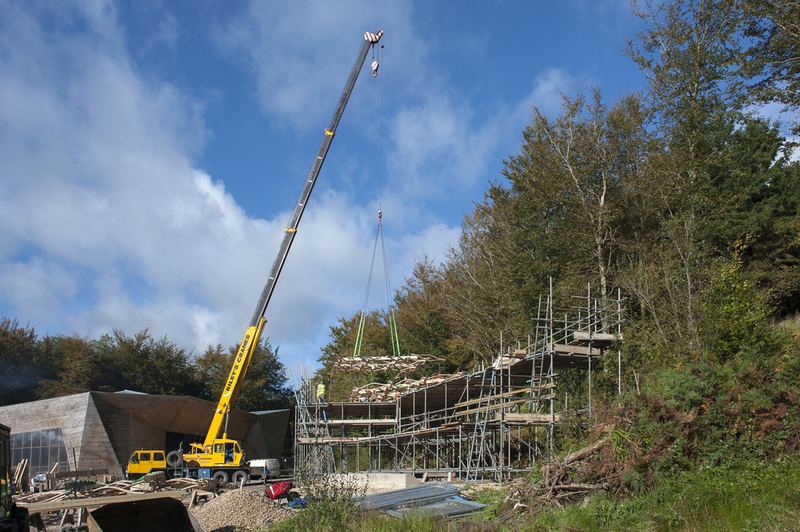 After three 8 meter x 8 meter patches were pre-assembled they were individually lifted onto an erected scaffold with predetermined marked locations within a 3 cm tolerance. 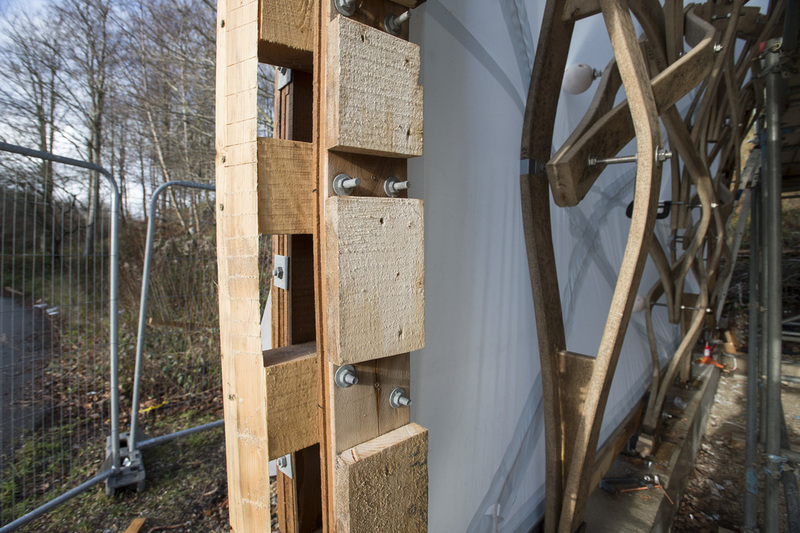 The fourth patch was left as loose components to be assembled in-situ onsite. The large patches were set down on top of temporary props before being seamed together and then columns installed. The structure is seamed together and depropped / self supporting. Fabrication and installation of the edge beam.